When I first moved to Barcelona in late 2003, I immediately fell in love with the vibrant spirit of the city. I just loved finding so much colourful graffiti covering the walls of the old city center. For me, a city without good street art is boring and uninteresting, really. 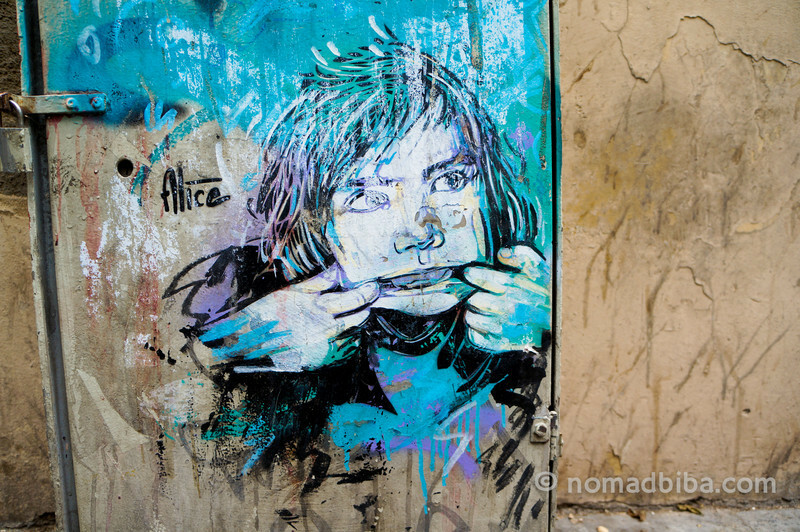 These first encounters with street art were the beginning of my obsession with photographing these ephemeral creations. For a couple of years after my arrival, Barcelona was a great place for urban art. It was a place where artists from all over the world would come to leave their marks. 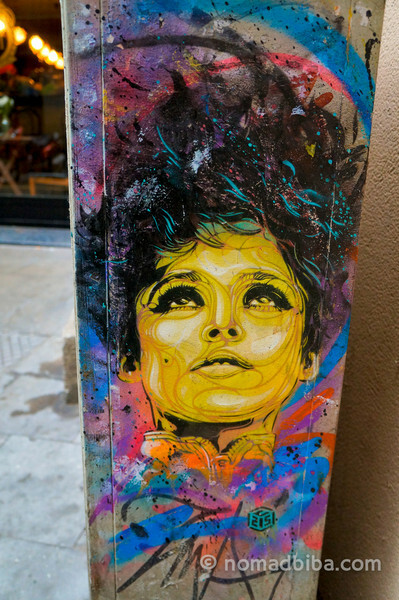 My favorite artists at the time included locals such as Pez, one of Barcelona’s most celebrated and happiest street artists, featured on the opening photo of this post; and Miss Van, an artist from Toulouse who paints sensual female characters with slanted eyes. 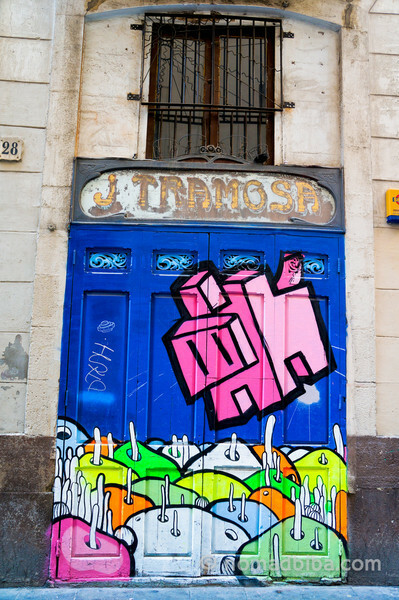 However, things started to change in 2005 when Barcelona’s politicians decided to crack down on graffiti because they view it as an antisocial act that contributes to the deterioration of the urban landscape. Soon, the streets of Barcelona went from featuring a polychromatic anarchistic look to being covered with the ugliest shade of brownish gray; in my opinion, it was a big lost for the city’s bohemian character. Nowadays, urban artists have very limited options to display their work without getting in trouble, so there are fewer murals around Barcelona. From what I saw during my latest visit, most of the street art is now relegated to doorways and metallic shutters from small businesses; they’re commissioned works by the owners that offer some breathing space for street culture. However, the policies of Barcelona’s local government are so anti-graffiti that at some point they were even threatening to fine both owners and artists for this practice. As a result of this, some artists have adopted the craft of paste-ups, a form of street art in which they create their work on paper and then glue it to walls, kind of like a poster; in part because it’s quicker to apply to walls, lowering the chances of getting caught. One of my favorite local paste-ups artists is BTOY, who has a distinctive style and you can see many of her works around Barcelona. 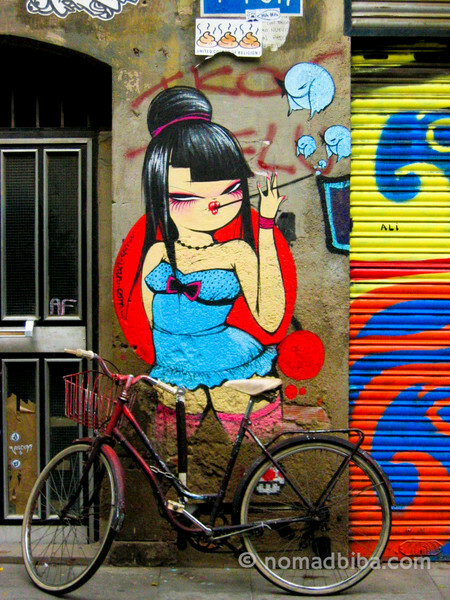 Fortunately, the street art scene hasn’t entirely died and we can still find works by internationally renown artists, such as the Parisian C215, who creates intricate stencil art; Italian artist Alice Pasquini, whose works are found in many European cities; and Broken Fingaz, Israel’s most famous graffiti crew. Still, the situation is less than ideal, specially when other cities across the world are actually embracing street art and finding creative ways to give it some space; such as: Berlin, Bologna, Buenos Aires, Toronto and Lisbon. Perhaps, the situation in Barcelona will change someday. At the moment there are different initiatives that aim to engage the local government in an open dialogue to change its policies. This year, there are a couple of documentaries coming out that tell us about how the situation has shifted in Barcelona. First there’s the feature-length documentary Las Calles Hablan, which is premiering next Saturday April 27th at NIU in Barcelona (by invitation only). The producers behind this documentary have also organised an online petition to ask the local government to review its policies on street art in Barcelona. The other documentary soon to be released is Bcn Rise and Fall, by local artist Aleix Gordo Hostau, which also gives us some insight into the changes that have shaped the urban art scene in Barcelona. I sincerely hope that both of these initiatives would reverse the situation in Barcelona and restore the city to its former glory. 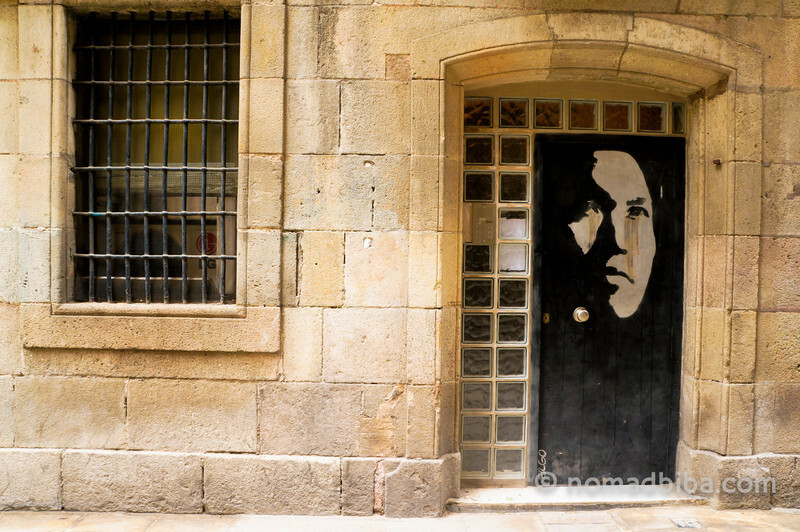 For more street art photos from Spain, you can visit my gallery. Also, please consider signing up the online petition at change.org and share it with your friends. Finally, if you love street art and are on Facebook you can subscribe to my Street Art interest list for updated links. Sorry to hear about the street art scene in Barcelona. I’m a big fan. Yes, hopefully it all will change soon :) Thanks, Matthew! Love street art. Did my first graffiti tour in Toronto recently and can’t wait to explore the works from around the world. Think I like the name “Street Art” much better – sounds much more like what it is you are looking at than graffiti that has such a bad connotation. The paste up look nice too…but I think I prefer the building texture shining through on the art that is painted in situ.